To find internship opportunities, go to Job Openings. Why be a United Nations intern? If you are thinking of entering the world of diplomacy and public policy, an internship at the United Nations could be the ideal start for you. The objective of the internship is to give you a first-hand impression of the day-to-day working environment of the United Nations. You will be given a real chance to work with our people. As part of our team, working directly with outstanding and inspiring career professionals and senior management, you will be exposed to high-profile conferences, participate in meetings, and contribute to analytical work as well as organizational policy of the United Nations. Initially you will take on the amount of responsibility you can shoulder; the potential for growth, however, is yours to develop. 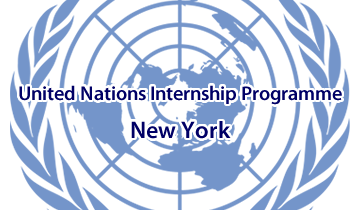 Can you be a United Nations intern? Are you enrolled in a Master's or in a Ph.D. programme, or in the final year of a Bachelor’s programme; or within one year after graduation from a Bachelor’s, Master’s or Ph.D. programme? Do you have excellent command of English or French? Are you neither a child or a sibling of a United Nations Secretariat staff member? If you are interested in internships with other United Nations funds and programmes listed, please apply with them directly through the links below.